Made between Husbands and A Woman Under the Influence, John Cassavetes’ offbeat romantic fairy tale may be the director’s most accessible & charming movie. A quirky, joyous and punch-drunk love story, the film follows an unlikely, opposites-attract romance blossoming between museum curator Minnie (Gena Rowlands) and parking lot attendant Moskowitz (Seymour Cassel). It’s an acting tour de force with Timothy Carey, Val Avery, Cassavetes and his mother Katherine in key supporting roles. 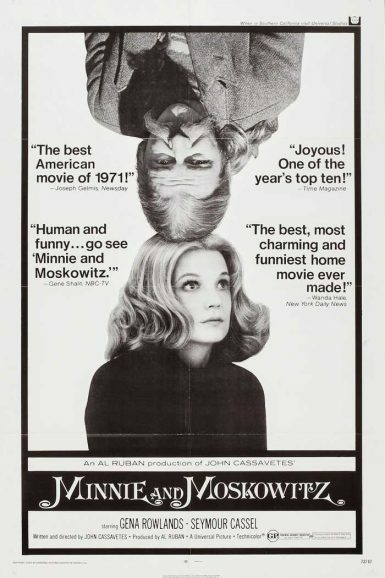 Kim Morgan discusses Minnie and Moskowitz on the New Beverly blog.